Imagine a pregnant body. It’s pretty easy when our imaginary person is seven or eight months pregnant. But what about their body in the early months of pregnancy? That shape’s a little harder to define. To be sure, the early weeks bring some changes: Fuller breasts, glowing skin and the beginnings of an expanded belly. In the months ahead, all of your edges will soften and expand as your baby continues to grow. While you watch this happen, trust that your body is doing what it is designed to do. In our image-oriented culture, it’s important to realize that your body is changing and filling out for an amazing purpose. 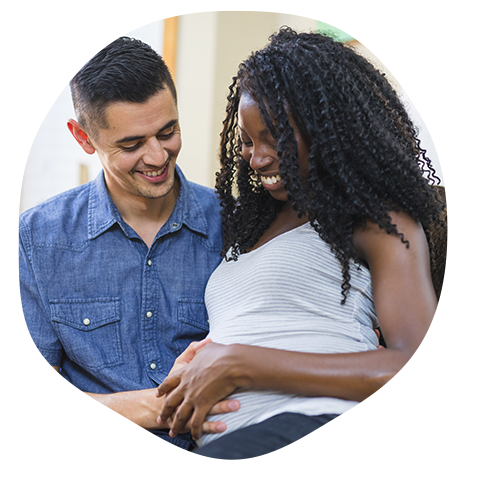 "Pregnant [people] become spiritually and physically attractive," writes Frederick Wirth, MD, author of Prenatal Parenting: The Complete Psychological and Spiritual Guide to Loving Your Unborn Child. "There’s a serene radiance of fertility and ripeness." That’s a wonderful way to think about the beauty and wonder of your body changing in response to your baby developing inside you. Believe in that and nurture yourself during this time. The way you act, feel and think while pregnant actually has a profound impact on your baby. Athletes know what it’s like to get in shape, to feel in sync with their bodies and to be both relaxed and ready. Where pregnancy health can be similar to training for a mountain climb. It’s a time to strengthen the body and build stamina for the hard work of labor and childbirth, to be mindful of what you eat and to prepare body and mind for the big event and the prize waiting at the end. It may seem silly, but the E.V.E.R.E.S.T. acronym can help you remember to care for your body during the months before childbirth. EAT: Take care to eat wisely and drink plenty of fluids. You don’t have to follow a precise diet, but be as healthful as possible in your everyday food choices. VISUALIZE: Hold a positive picture in mind of your body blossoming into motherhood. The weight you’re gaining might not thrill you, but you’re working toward a very high purpose. EXERCISE: Walking and yoga provide low-impact workouts that help condition your pregnant body while providing a healthy outlet for your heightened emotions. READ: Seek out newsletters, websites and books that help you build confidence rather than cause you to worry about your body, your baby and your pregnancy. ENGAGE: Find a friend or two to share your concerns and questions within these early weeks. Connecting with those who understand the adjustments that come with pregnancy will bring you peace. SLEEP: Sufficient rest is key to your well-being throughout your pregnancy. Like exercise, paying attention to your need for rest will help you deal with any shifting emotions. TRUST: Self-affirmation doesn’t just happen. Increase your confidence in your ability to give birth by actively choosing to believe in yourself and your body. You know exactly what you’re doing. What if you continue to have trouble getting your mind around your new, ever-changing body? Know that you’re not alone. The first few months of pregnancy are a time of tremendous change, driven by hormones and emotions. Worries can crop up along the way: Lack of control about how your body looks, fear of losing your attractiveness, anxieties about labor, fear of the pain of giving birth, sacrifice in lifestyle now and in the future . . . the list can go on. Stop, take a breath, and keep that "mountaintop goal" (that first moment when you will hold your newborn in your arms) in sight. There’s no doubt that, with every passing day, you will feel bigger because you are growing not just in pounds, but in strength and as a person, too. Make it a habit to let your hands rest on your pregnant belly and, in that quiet moment, consider all that is happening inside your body. Know that the life you feel at your fingertips is worth the gain.